The Connecticut state seal identifies government buildings and officials and is a centerpiece for the Connecticut state flag. The symbolism, history and emblems of the Connecticut seal are described with fast facts and info. Fact 5: It was redesigned in 1784 and the three vines are believed represent the three colonies of New Haven, Saybrook and the Connecticut Colony. 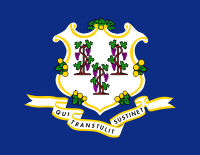 The origin of the Connecticut motto was explained in an article written in 1889 by State Librarian Charles J. Hoadley who said that "The vines symbolize the Colony brought over and planted here in the wilderness... expresses our belief that He who brought over the vine continues to take care of it "Qui transtulit sustinet.". 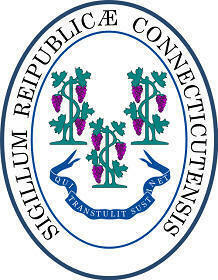 The original Connecticut design with 15 grapevines displays an image representing the hand of God holding the banner. The new, less elaborately decorated Connecticut seal with 3 grapevines was larger in size and more oval shaped than the original design. The Connecticut seal is kept and used as required by the Constitution and laws of the state. The picture of the flyer shows the seal of colonial Connecticut in 1876 in which the 3 grapevines are shown as three trees. The flyer is interesting as it reflects the lifestyle of the people. The pioneers and the use of the famous covered wagons and the settlers with their log cabin house behind them.